Product #21101 | SKU 033202 | 0.0 (no ratings yet) Thanks for your rating! 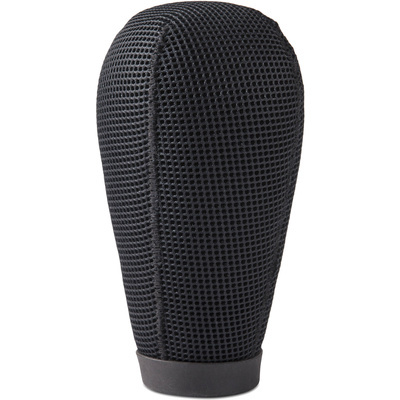 The Rycote 15cm Super-Softie Wind Shield for Shotgun Mics features an aerodynamic shape and surface structure made from the company's 3D-Tex material, which allows for attenuation of wind noise with acoustic transparency. It is suitable for a variety of sound recording applications including video, ENG, and more. The 15cm Super-Softie has no rigid internal structure, thus it causes virtually no polar pattern distortion. Its robust design has been engineered for use in challenging environments, and if it becomes rain-soaked, it can be squeezed out and shaken dry quickly. Also, if it becomes coated with dust it can be rinsed quickly without affecting its performance. Finding the correct slip-on windshield will depend on the type, length, and diameter of the microphone. Slip-on windshields are designed for cylindrical shotgun mics, ranging from 19-25 mm in diameter. For any windshield to work effectively it must cover all the ports on the microphone. Therefore a 15 cm slip-on windshield would be suitable for shotgun microphones, with slots no further than 15 cm from the front of the mic. The diameter of the microphone is also key, as the fit must be tight in order to achieve a good seal. Rycote slip-on windshields come in three diameter fittings, Universal (19-25 mm), Standard (19-22 mm), or Large (24-25 mm).